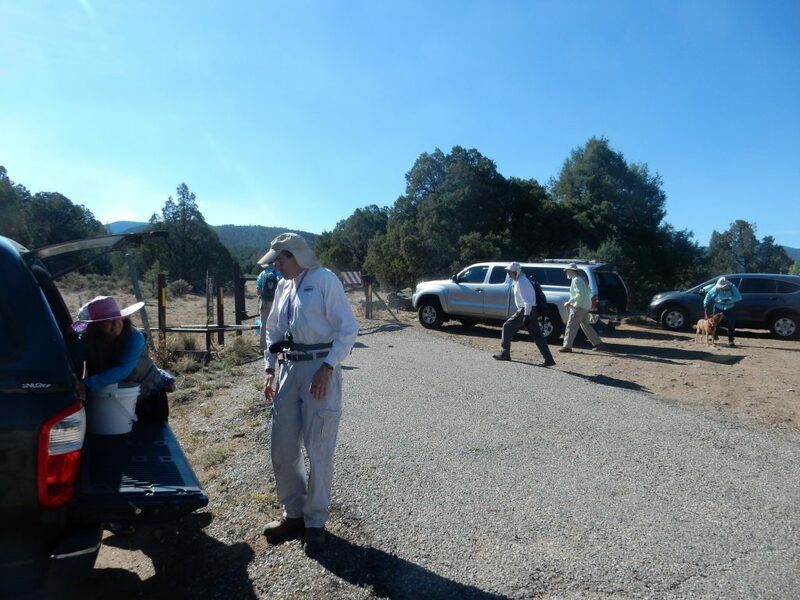 The Los Alamos Geological Society field trip this weekend was to Fossil Ridge, a choice site for amateur paleontology since the late 19th century. So I was up at 6:00 to prepare, by eating a good breakfast and loading my stuff in the car. I would be using a new backpack Cindy gave me for Father’s Day. The hike to the fossil site from the trail head was reputed to not be far (“about a quarter mile”) so this seemed like a fairly easy adventure. No time to pause much on the way, but I could not resist this picture of the Chamita Formation south of Black Mesa, which was lit just right by the early sun. Hmm; I forgot I had the camera set on dusk/dawn. (See previous post.) Reset and try again. Yeah, I think that’s better. I think I’ve misunderstood this “dusk/dawn” setting. I thought it was optimized for taking pictures at twilight. Apparently it’s intended to make your pictures look like you took them at twilight. Live and learn. The Chamita Formation is part of the Santa Fe Group, which consists of the various rift-fill sediment units of the Rio Grande Rift. This is the great crack in the earth extending from central Colorado to the El Paso area, where it blends into the Basin and Range of northern Mexico. 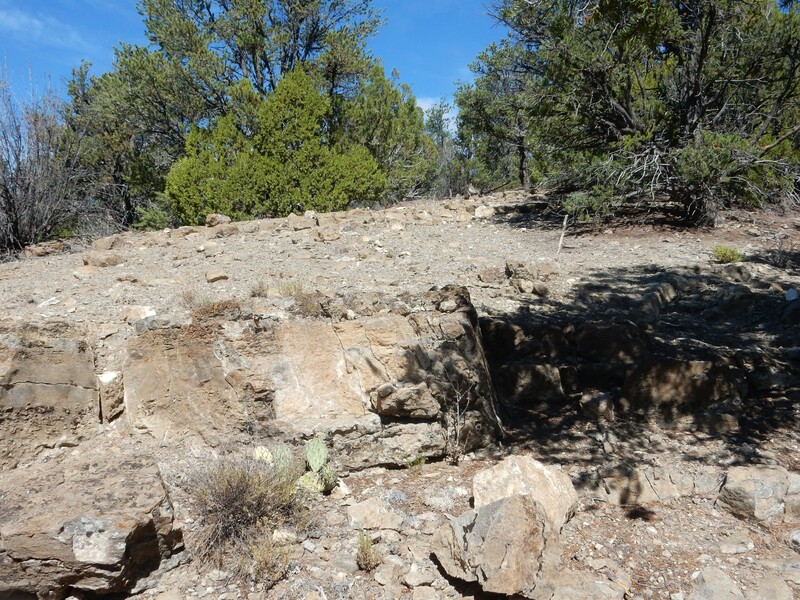 It’s more or less where the Colorado Plateau is pulling away from central North America. The valley of the Rio Grande River mostly coincides with the Rio Grande Rift. 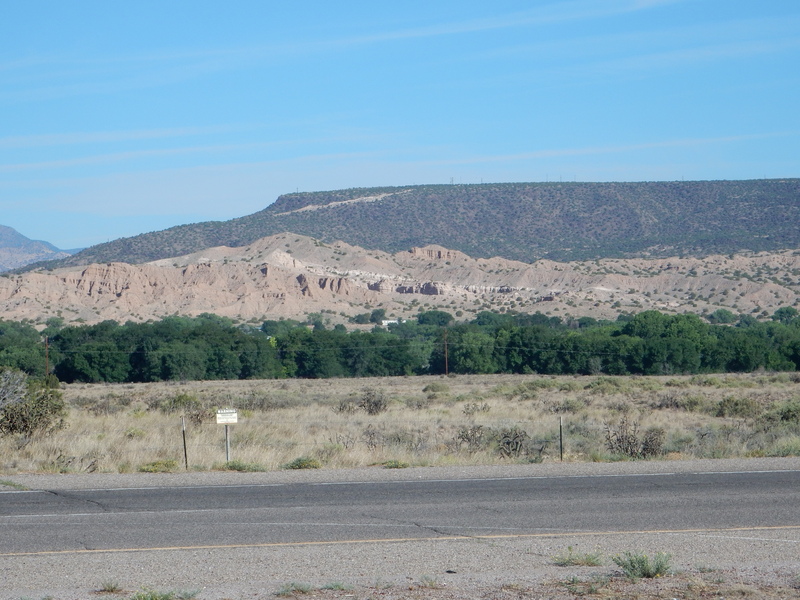 The main Santa Fe Group formation in our part of the Rio Grande Valley is the Tesuque Formation. 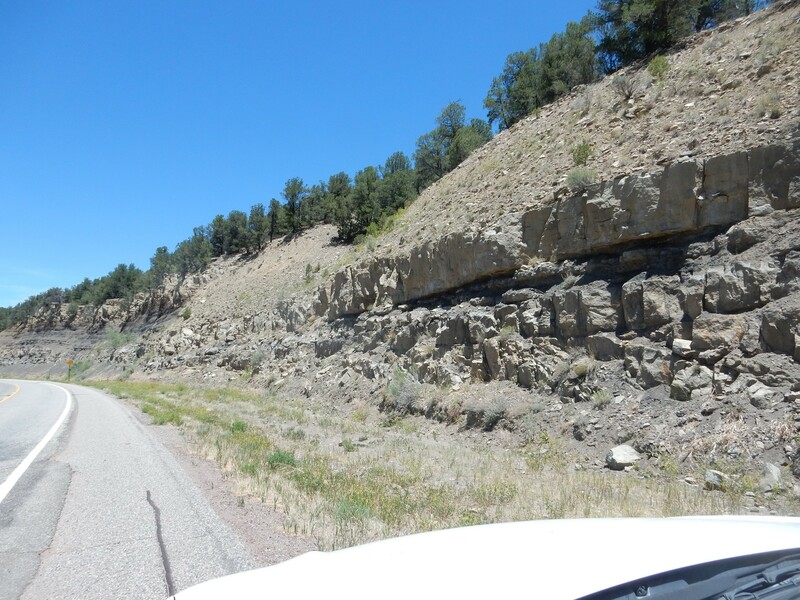 However, the uppermost beds of rift fill sediments in the Espanola area showed indications of being separated from the rest of the beds by a discontinuity. This is the geological term for a pause in the deposition of sediments, a kind of gap in time in the rock beds. Often a discontinuity involves erosion of the uppermost beds as well, before deposition of sediments resumes. 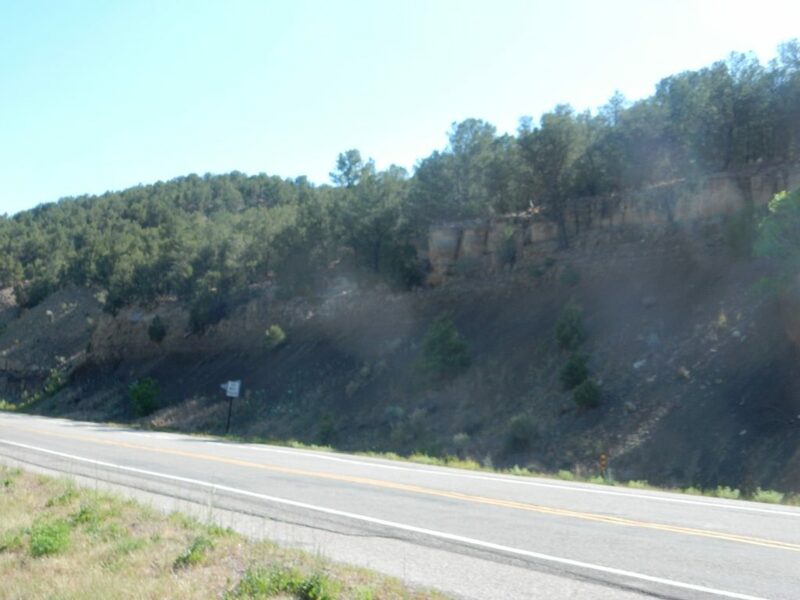 The presence of this discontinuity, as well as other subtle differences in the nature of the beds, led geologists to place these beds in a separate formation, the Chamita Formation. It turns out this is now a point of controversy. 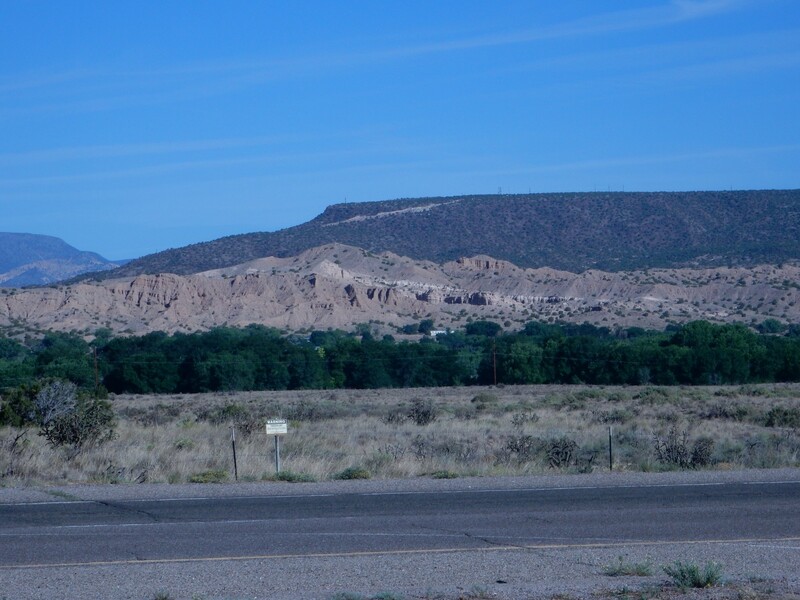 The Chamita Formation cannot be mapped everywhere in the Espanola area; in some places, the characteristic discontinuity simply seems not to exist, with the uppermost beds of the Santa Fe Group being more or less continuous with the lower beds assigned to the Tesuque Formation. So some geologists have suggested abandoning the Chamita Formation. Others continue to find the distinction useful. 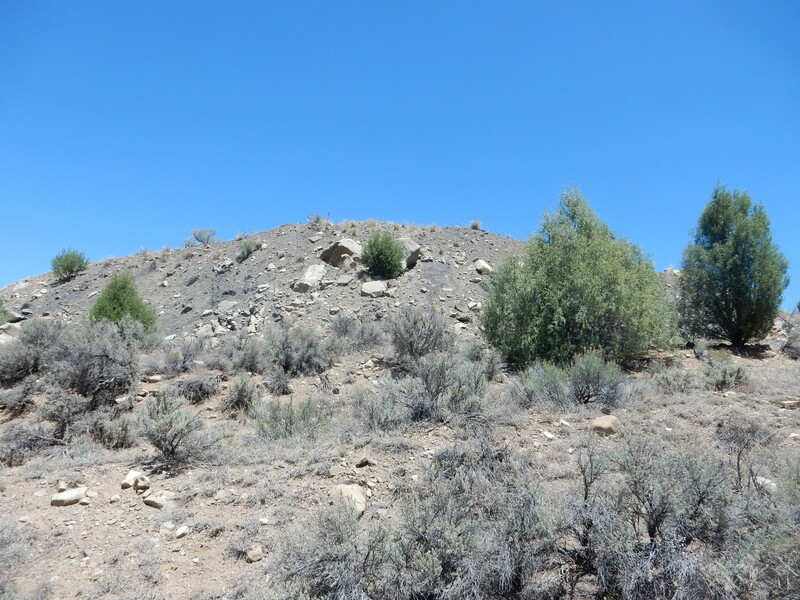 The white bed prominent in the center of the photograph, which dips to the right (northeast), is the Chamita Upper Tuffaceous Zone. 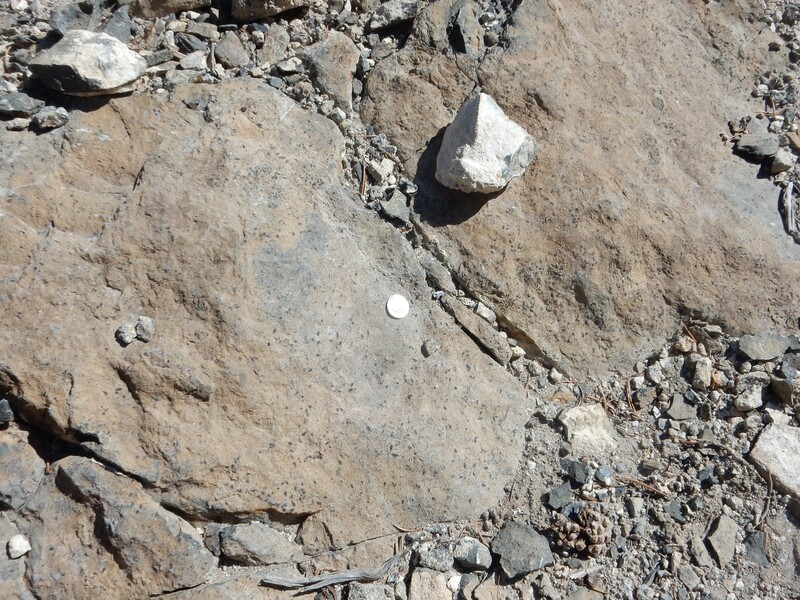 This is a layer of volcanic ash that has been quite accurately dated, using radiometric techniques, as 6.8 million years old. This is the same age as the Peralta Tuff at Kashe-Katuwe Tent Rocks National Monument, and the ash has a similar composition. It seems clear that the Chamita Upper Tuffaceous Zone is ash fall from the Peralta Tuff eruptions. Not wishing to be late, I hurried on to Rancho de Taos. However, the magnificent view as the road comes onto the Taos Plain was irresistible. At right are the Sangre de Cristo Mountains north of Taos. 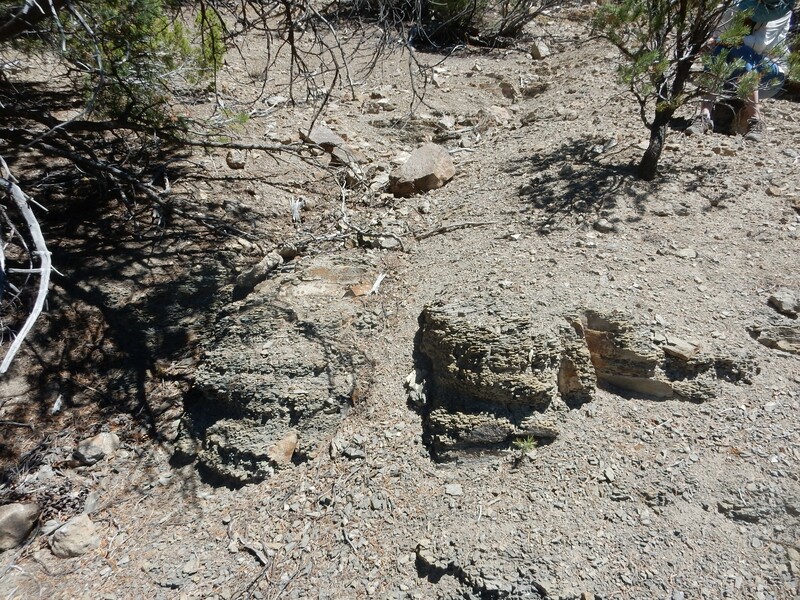 These form the eastern rim of the Rio Grande Rift over much of its length. 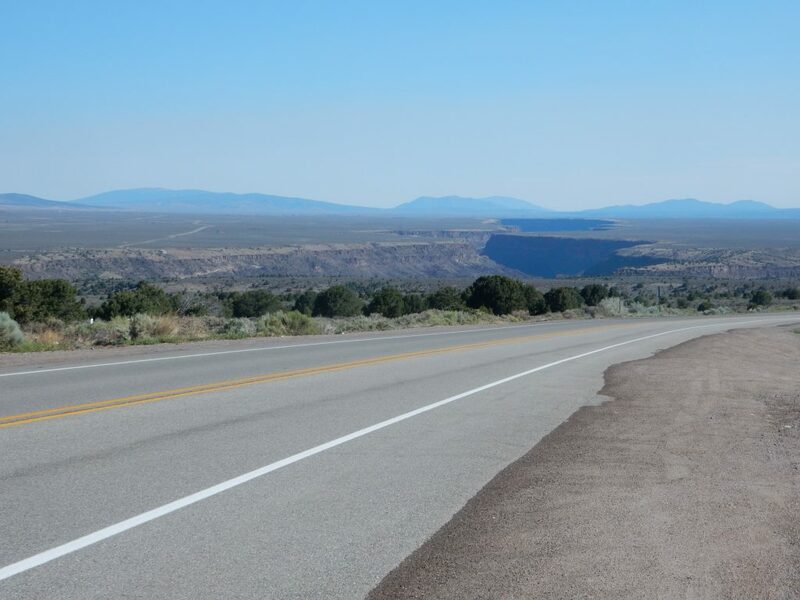 At left is the Taos Plateau, underlain by the Servilleta Basalt, formed from lava that flooded the area in multiple eruptions between 3.6 and 4.3 million years ago, based on radiometric dates. A number of domes and cones poke through the Servilleta Basalt; the most prominent in this photograph, left of center, is Tres Orejas. And, at center, we look almost directly down a section of the Rio Grande Gorge, where the Rio Grande has cut through the resistant basalt into the softer sediments beneath. Santa Fe Group, probably, but the map identifies everything in the gorge as landslide deposits. 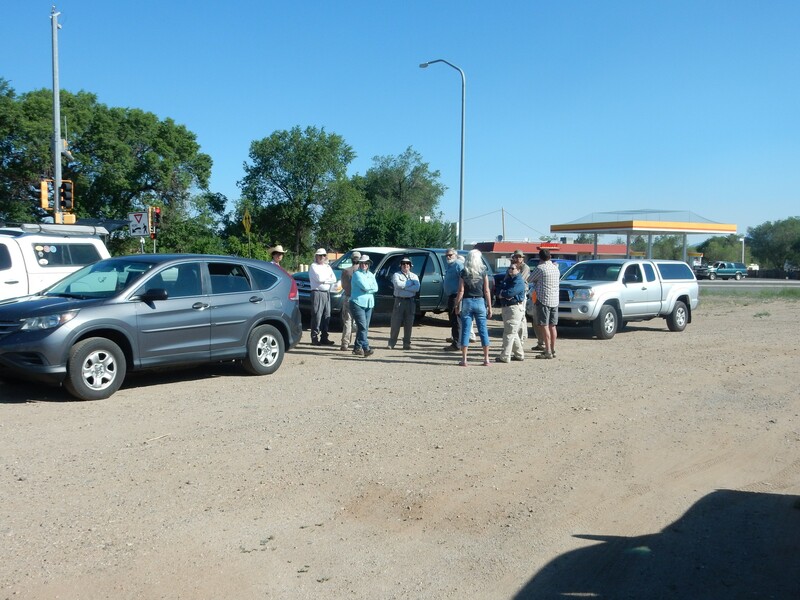 I arrive at the rendezvous at Rancho de Taos just as the group is preparing to leave. Huh. My watch says I’m early. Later I check my cellphone, then ask Rick Kelly what his watch says, to be sure: Yep, my watch was running 15 minutes late. We head south along the High Road to Taos. This runs along the valley of the Rio Grande del Rancho, which is apparently a small graben valley, where the central part of the valley has been dropped by faulting relative to either wall. Patrick Rowe, in the lead vehicle, pulls into a pullout and we all obediently follow. I start to gather my stuff, but Patrick explains that this is not our trailhead; he just wants to show us the road cut across the highway. Alas, this is looking directly into the morning sun. It’s all interbedded limestone and shale, interpreted as a river delta from the Pennsylvanian Subperiod, around 310 million years ago. At that time, northern New Mexico was mostly shallow ocean, but with some high ground associated with the Ancestral Rocky Mountains. The Ancestral Rocky Mountains, in turn, are thought to have been produced by the collision of North America with Africa as the continents assembled into the supercontinent of Pangaea. The nomenclature for the Pennsylvanian in New Mexico is kind of a mess. Historically, the thick limestone beds deposited in the Pennsylvanian sea were assigned by geologists to the Madera Formation. This later was promoted to the Madera Group, with various beds assigned to individual formations of their own, and more recently there have been calls to abandon Madera completely as a unit name. 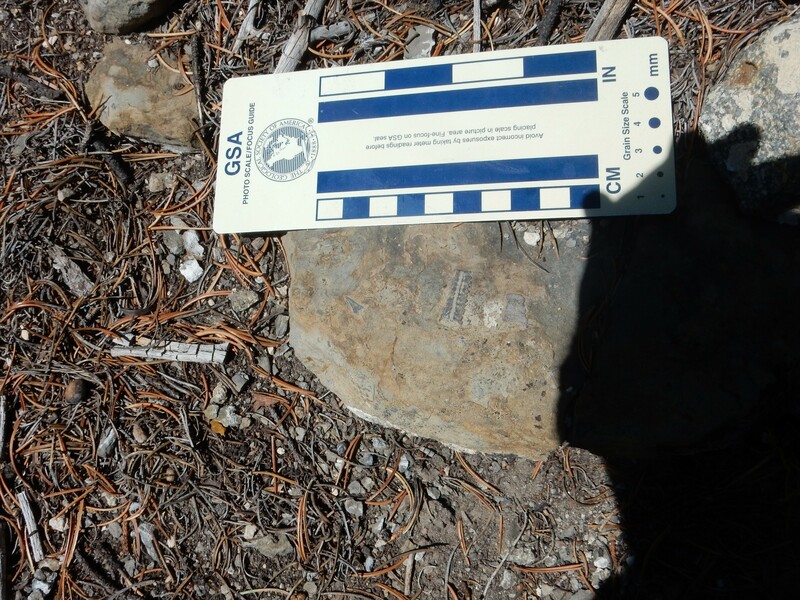 However, Madera has become so entrenched in the geological literature, and so many of the geologic maps of northern New Mexico still have the Madera Formation or Madera Group as a major unit, that that may not happen right away. The map here illustrates the mess. The map itself depicts practically all the limestone in this area as various units of the Alamitos Formation. However, the map is a preliminary map and, as is often the case, the accompanying report uses a different set of unit names. One of these is the Flechado Formation, which our guides today identify as the formation underlying Fossil Ridge. As near as I can figure out, the final version of the map will use Flechado Formation for the limestone-poor, sandstone- and shale-rich lower Pennsylvanian beds, and Alamitos Formation for the limestone-dominated upper Pennsylvanian beds. And Fossil Ridge will be mapped as Alamitos Formation. Regardless. We pile pack into our cars, head a little further down the road, and park around the trail head. That’s Lynelle Brode with her pup Quinn. If you want me to remember your name, introduce me to your dog. I’m odd that way. Speaking of which, I had to have Laci put down last week. She got lethargic and lost her appetite on Saturday; Monday she seemeed a little better again, eating and drinking; Monday night, she got quite restless, keeping me up (I confess I got grouchy at her), then Tuesday she became increasingly agitated. I took her to the vet when I got home from work, but not until Cindy and Kira, without any word on my part, came up and petted her goodbye. Geez. It’s hard to write about. The vet observed her walking in little circles and barking oddly, and told me this did not look good at all. She’s 14; in a way, the family had already made the decision. I held her as she dozed off for the last time. What I wrote when we first got her. I put on the new pack, and found that it seemed about the right size for a ten-year-old. I snarked about it to Patrick, who suggested he’d be happy to take it if I didn’t think it fit. Turned out the shoulder straps were cinched up all the way. With some adjustment, it turned into a credible adult back pack. The trail is apparently an old road into the delightfully named Bear Wallow Canyon. It heads east and then north, and here it crosses some steeply dipping beds. Rick Kelly greeted this like an old friend, calling it by name. Which name, alas, I did not catch, but I do not think it was Alamitos Formation, which is what this area seems to be mapped as in the new preliminary map. To be more precise, it’s mapped as IPass5, which seems vaguely vulgar, is not defined in the accompanying legend (because they’re not yet in synch), and is not terribly informative. The road hits a crossing. There is an uprooted sign, which is not very helpful. There are also numerous fresh mountain bike tracks on the cross road. We turn left, which turns out to be right, if you follow me, and in fact a cyclist passes us moments later. The trail is clearly popular with mountain bikers. Soon the road crosses what looks rather like a dike or intrusion. The rock is much darker, and appears to be heavily calicified. (Which seems redundant in an area entirely underlain by limestone.) Fresh surfaces are very dark and look almost glassy. However, close examination shows them to be a very fine-grained limestone. The geologic map maps this outcrop as a ribbon inscrutably labeled IPasu (though the “u” suggests “undivided”). And not far past that are limestone outcrops sprinkled with fusilinids. 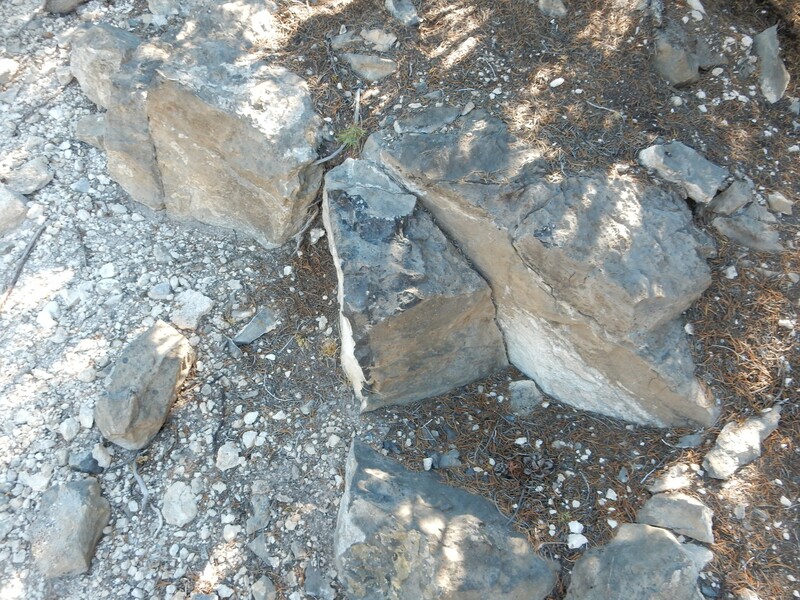 This is part of a second outcrop of the darker limestone. The black specks are the fusilinid fossils. Fusilinids were a family of foraminiferae, giant testate amoebas, that evolved very rapidly in the Paleozoic and so are excellent means of pinning down the age of a unit. Assuming you know how to extract them from the unit and examine them in great detail under a microscope, which I do not. And I suppose there were no amoeba probate courts to try cases where an amoeba died intestate. Regardless, I want a sample, but take Rick’s excellent advice to save some weight in my pack and pick up my sample on the way out. Another fork, where we again correctly go left, and Rick identifies the hill across the arroyo as Fossil Ridge. 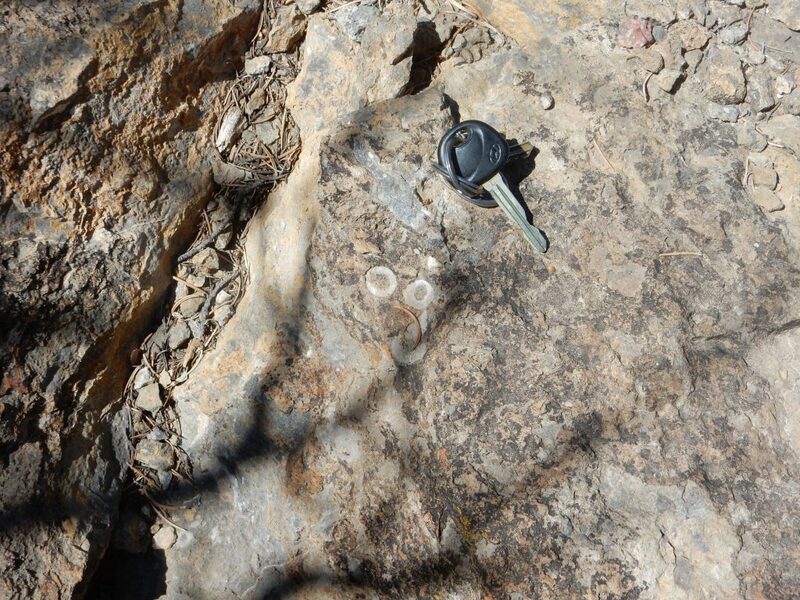 We are soon there, and I spot my first fossil. A small brachiopod towards the top of the stone. I am working along the north side of the ridge, looking for graptolites Patrick Rowe reports can be found there. There are some strange ribbons in some of the rocks. 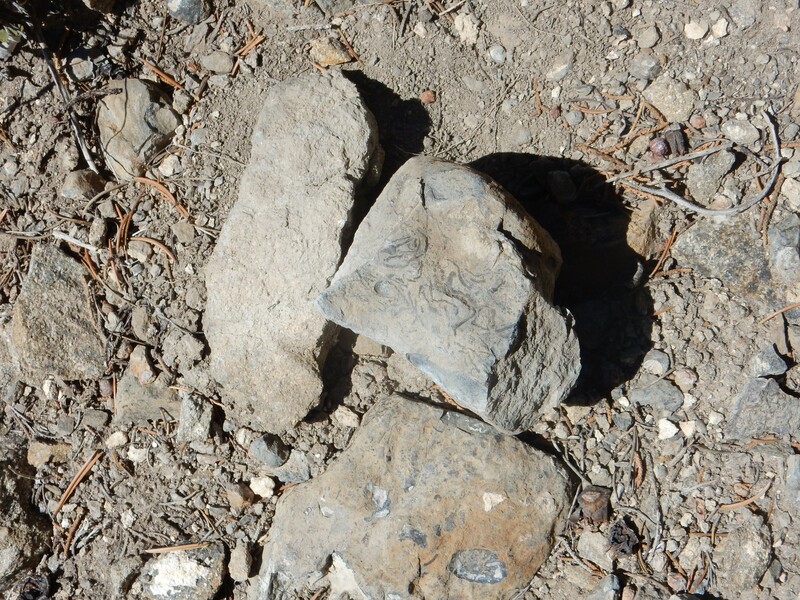 Trace fossils? Sedimentary structures? 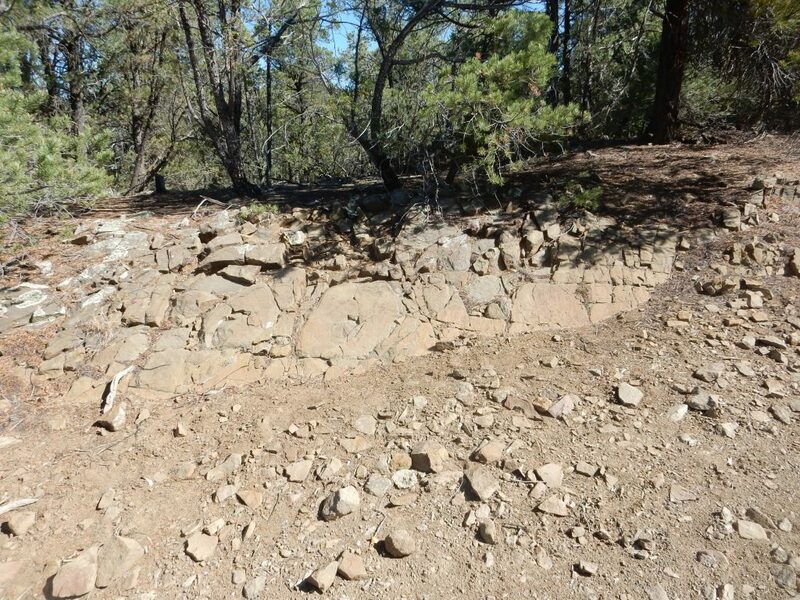 Rick suggests sedimentary structures produced by storm surges. Limy beds towards the top of the ridge. I convince myself this is a graptolite. Only later am I disabused. It’s a crinoid stem in cross section, which is still kind of cool; just not as cool as a graptolite. Graptolites were wormlike animals, distantly related to vertebrates but probably more closely related to echinoderms. They are preserved only as thin carbon films on rock surfaces. The Pennsylvanian was their last hurrah; they went extinct by the Permian. Crinoids, or sea lillies, are echinoderms that are still part of the ocean fauna today. They consisted of a cluster of “fronds”, feeding tentacles, at the end of a long “stem” attached to the ocean floor. They were extremely abundant in the Pennsylvanian, and their calcified “stems” are very common fossils. 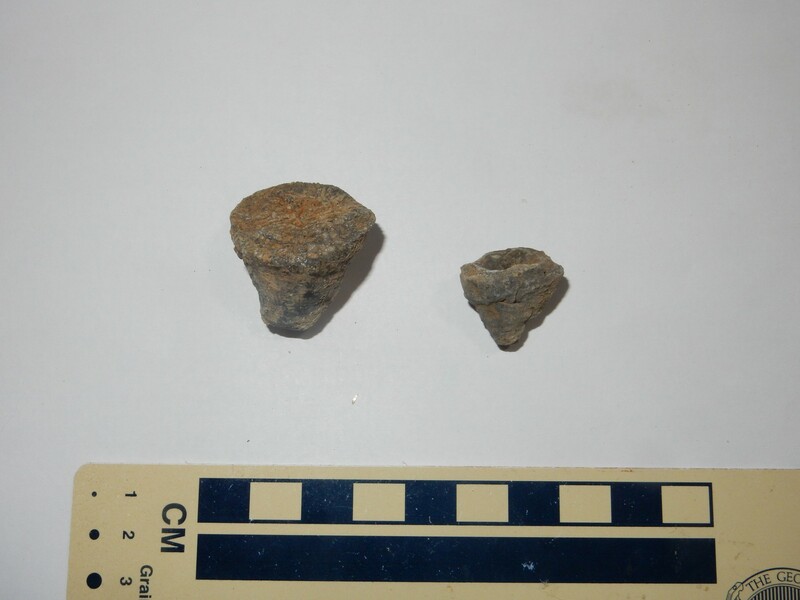 I have several in my collection already from the area near Battleship Rock. 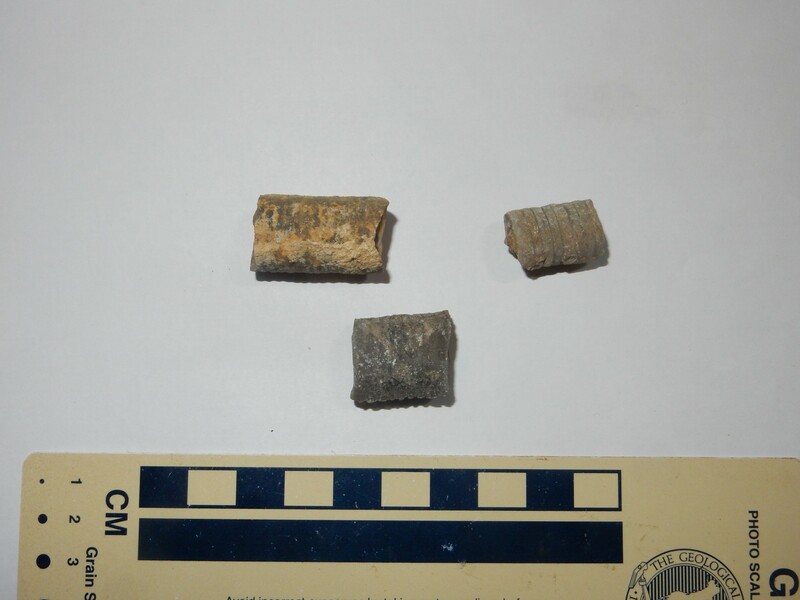 Here are some crinoid stems still embedded in limestone. 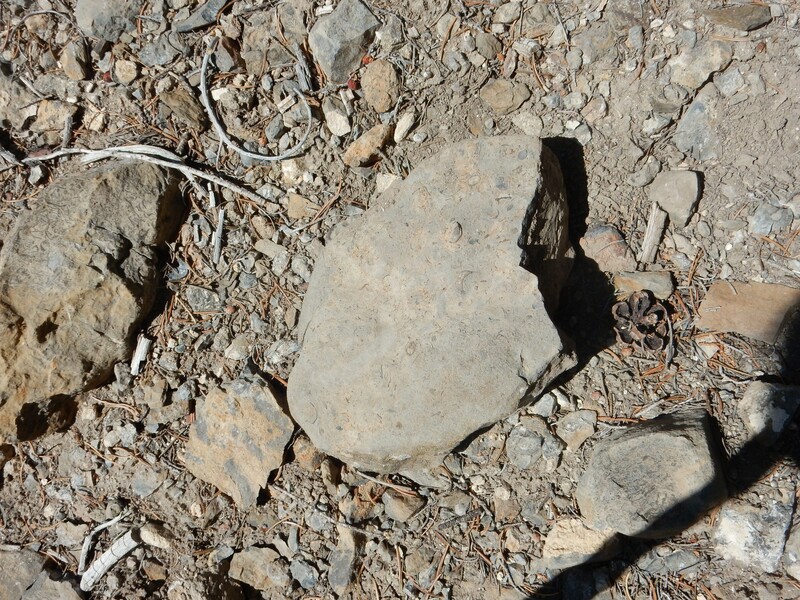 At about this point, I stopped looking for fossils in rock beds and started looking for fossils already weathered out of the beds and present in the gravel on the slopes. This proved much more productive, though it took some time to train my eyes to spot them. Some examples presently. A view down the canyon to the south. I initially worked my way west and generally towards the top of the ridge, where there were numerous limestone beds and lots of limestone gravel. This proved fruitful. Brachiopods resemble mollusks, but only superficially. Their shells lie on the top and bottom of their soft bodies, whereas the shells of bivalve mollusks lie to either side of their soft bodies. As a result, mollusk shells tend to be more symmetric; brachiopod shells are asymmetric, particularly around the hinge. 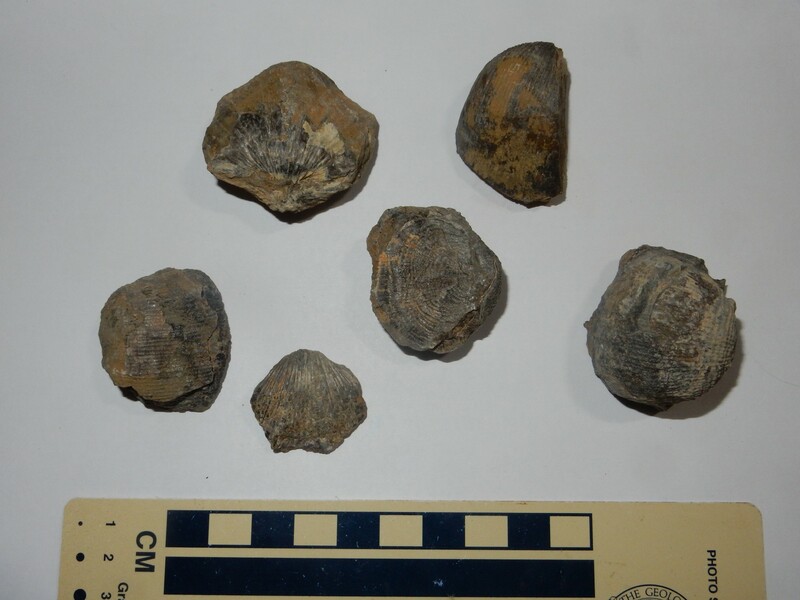 Brachiopods dominated the Pennsylvanians seas, but in the modern world, they are rather less common than mollusks. These were probably the coolest finds of the day; I’ve never found horn coral in the field before. I worked my way down the hill into beds that were more calcareous shale than limestone. Alas, these beds proved unproductive. But then, by this point I had a large bag (I only included my best fossils in the photos) and was tired, so I wasn’t hunting as enthusiastically. I’ll keep the best, including a few for my niece and nephew, and donate the rest to the Pebble Pups. Rick Kelly showed up about this point, or rather Yeso showed up and Rick soon followed. He had found the best beds in the area, naturally. I may have to start tagging along with him on these trips. Still, his description was good enough that I can probably find them if I come out this way again. We had lunch and began hiking back out. Rick noted dryly that this seemed like more than a quarter mile. I make it about three quarters of a mile each way on Google Maps. Still not a bad hike. 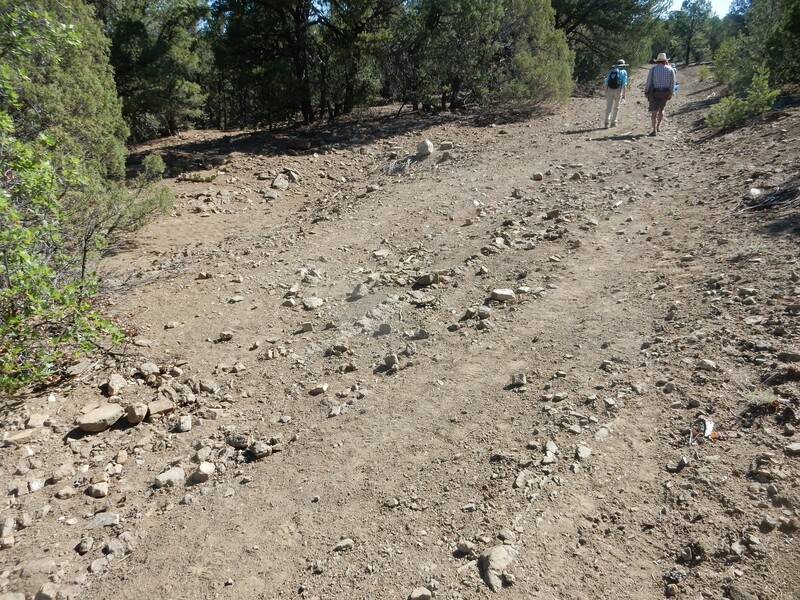 Towards the end of the trail, we passed what looked very much like mine tailings. Rick and Patrick speculated that there might have been a small coal seam here. Curiosity got the better of me, and I headed up. The hill was awfully steep and I still have one ankle that can be broken. (The other has a steel plate and is supposedly unbreakable now, but I don’t want to test that.) However, there was a way around. It did look a lot like tailings, but there were no shafts or adits visible, and a lot of old highway asphalt and concrete had been dumped here. The only unusual-looking rock was some dark ferruginous sandstone, easy to mistake for coal tailings from a distance; perhaps someone was looking for iron or manganese? Apparently these aren’t actually the ones you use for dating the rock. 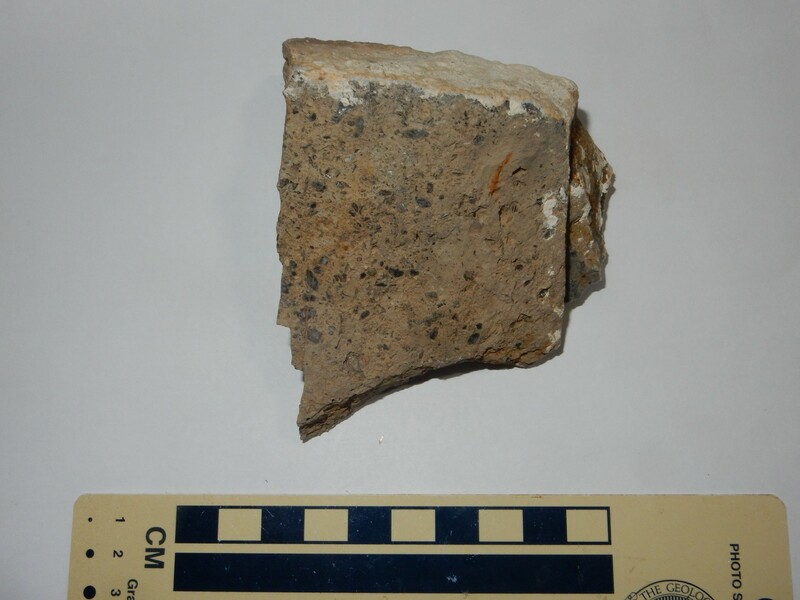 You look for a soft shale layer in the beds and sieve it for loose fusilinids. Still, a nice addition to my collection. And then home; a long drive where I struggled once or twice to stay awake. I hate to admit it, but I actually lost some sleep the night before because a friend was wrong on the Internet. Whoever heard of such a thing?